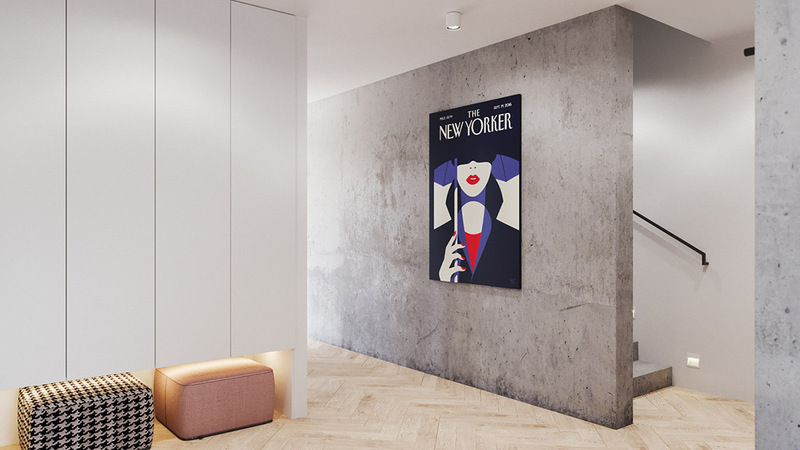 If you’d like to showcase some art around your home but are not quite sure what pieces will work, or how best to display them, then you’ve come to the right place. 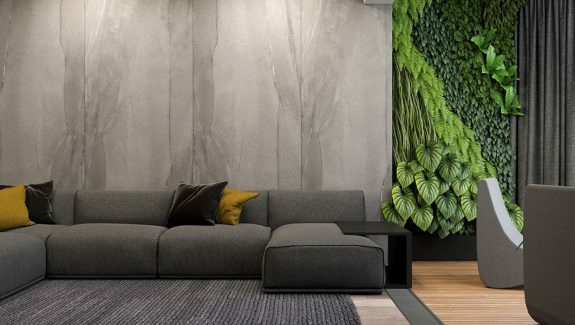 These two modern home interiors use cool concrete decor as a backdrop for vibrant wall art. 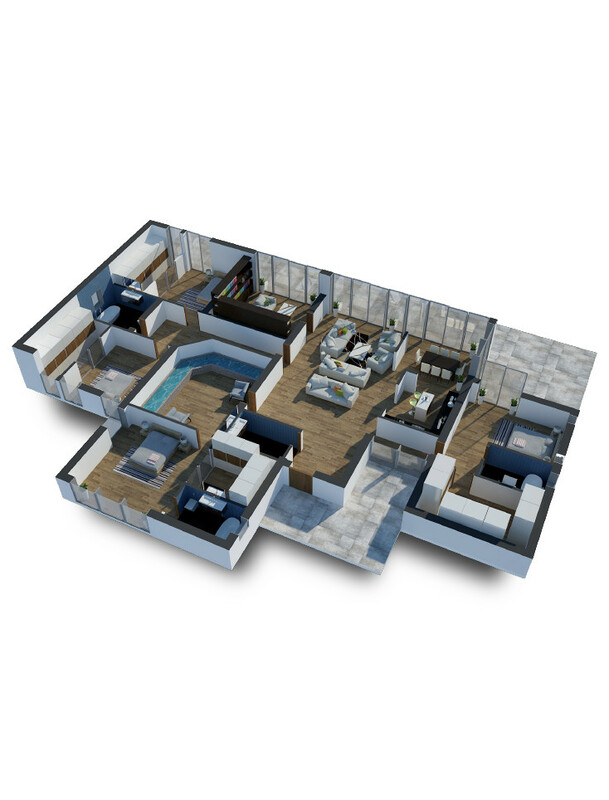 We’re not sure whether the art has inspired the colour palette for the rooms, or if decor influenced art choice, but either way works. Colours in the art and the room work hand in hand to create rich and vibrant spaces that are a joy to be in. 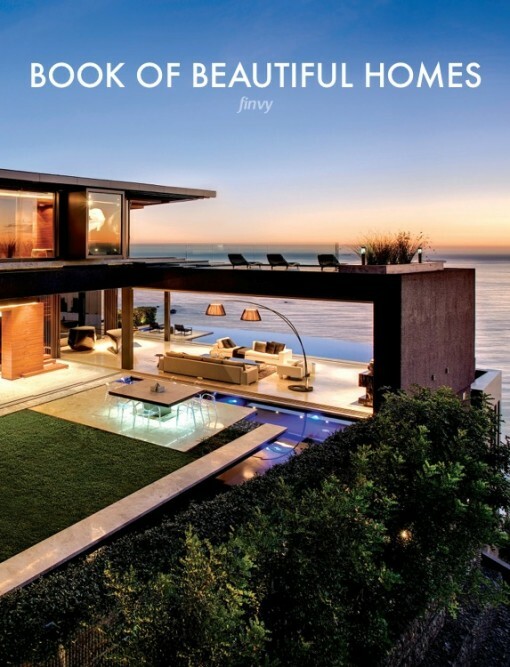 The art is eye-catching, but so is the contemporary furniture, unique lighting and modern feature walls. 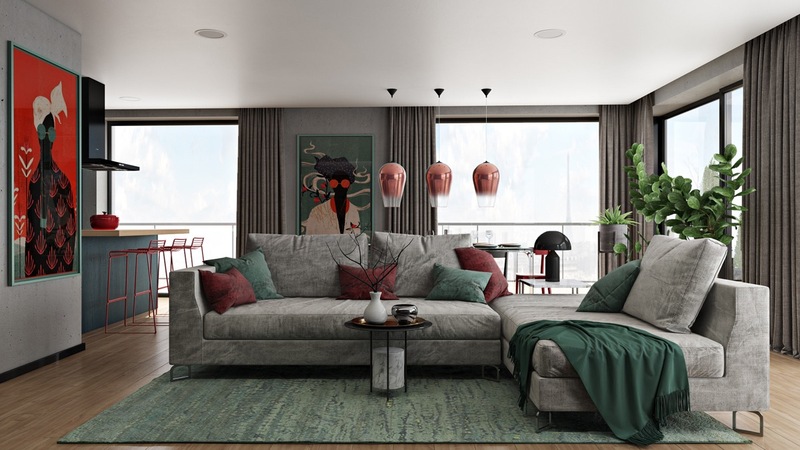 Green and red are the key colours in this living room’s soft furnishings, and in the striking contemporary wall art hung on columns of concrete. 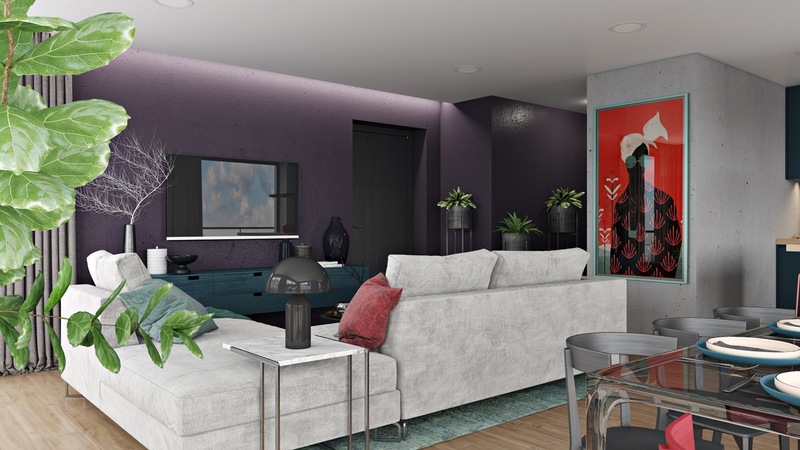 A contrasting purple wall opposite the sofa makes the room look young and fresh. A couple of black ornaments and accessories around the room tie in with dark notes in the art pieces. A black Atollo lamp stands out on a white side table by the sofa. Cheaper replicas are available on Ebay. Copper dining room pendant lights are suspended in a line of three along the dining table behind the sofa. The copper tones complement the red accents in the art. 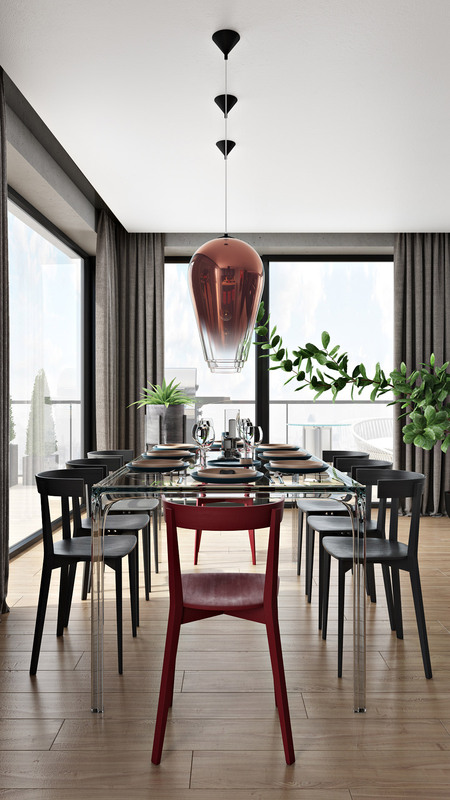 Two red dining chairs bring the hue to the head and foot of the table. A plant stand grows some greenery in the corner by the window. 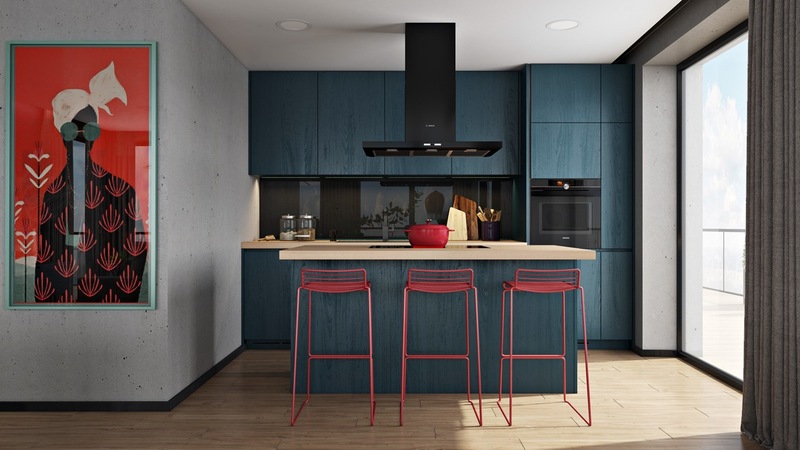 A trio of bright red kitchen bar stools line up along a blue island in the open plan. They are the Hay Hee bar chair. Heavy grey window drapes tone with the raw concrete walls. 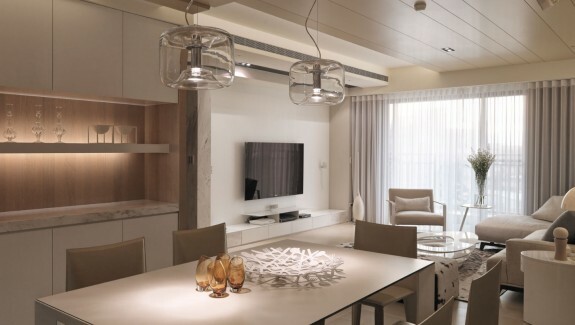 The clear perspex dining table allows natural light from the dual aspect windows to pass straight through it. 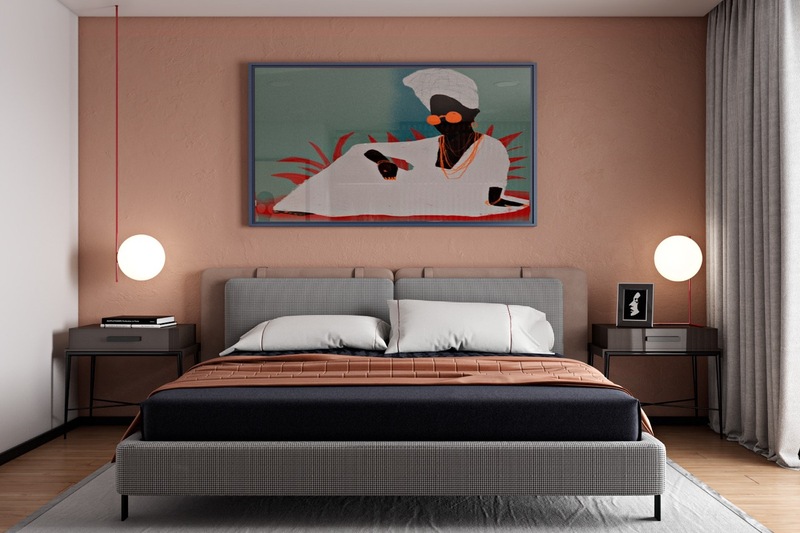 We find more colourful modern art inside the master bedroom, positioned in pride of place over the headboard. 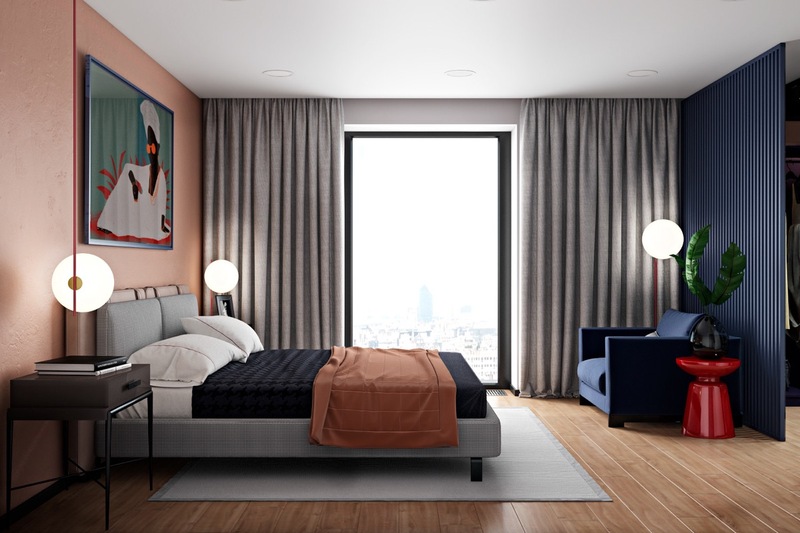 A red stemmed bedside table lamp illuminates one side of the bed, whilst a matching bedroom hanging light serves the other. 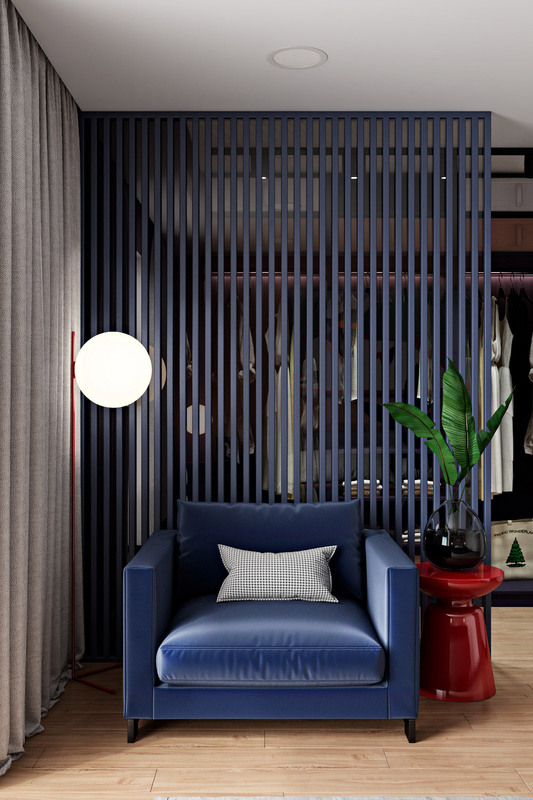 There is also a matching floor lamp in the set, which has been teamed with a blue accent chair here. 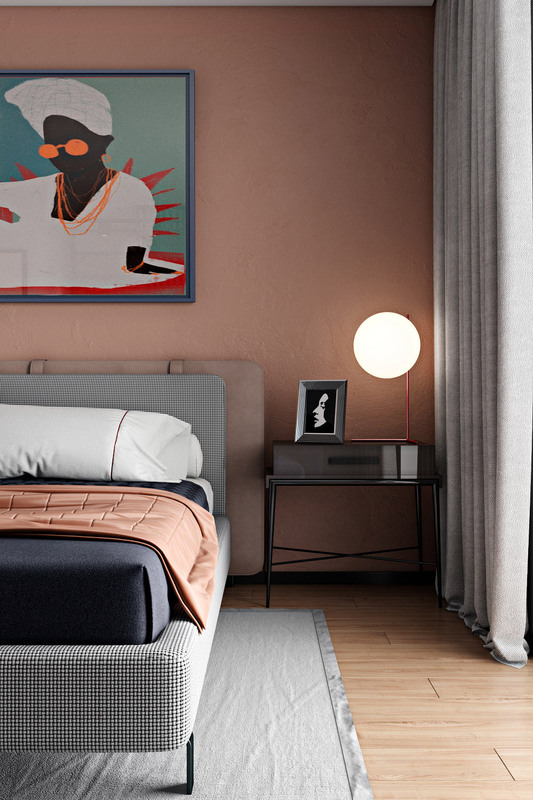 The bed throw is a tan shade to match the coloured concrete feature wall. The warm neutral hue works to calm the clash of red and blue accent pieces. A red side table joins the blue bedroom chair and modern floor lamp to fashion a chic little resting spot. The bed is upholstered in a youthful monochrome fabric, which whilst bold does not fight for attention with the colourful wall art. Our other living room showcases art with a retro look, though the furniture choices are very much up to date. 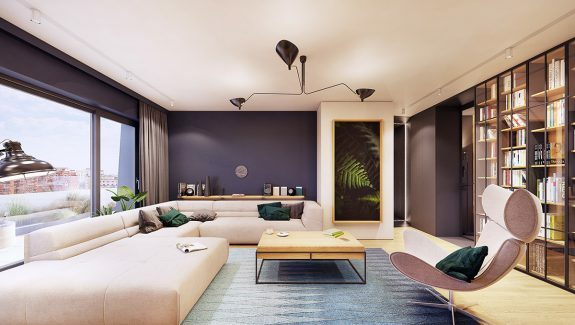 A swing arm wall lamp is poised to illuminate the art on the concrete wall at nightfall, and to shed light over a modern sofa. 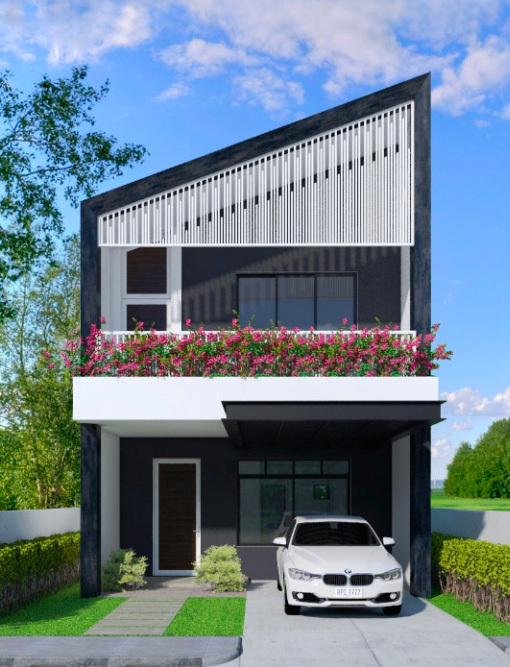 Panoramic windows bathe the entire open plan lounge/kitchen/diner in natural light during daytime hours. A large grey rug softly defines the lounge area from the rest of the multi-use layout. 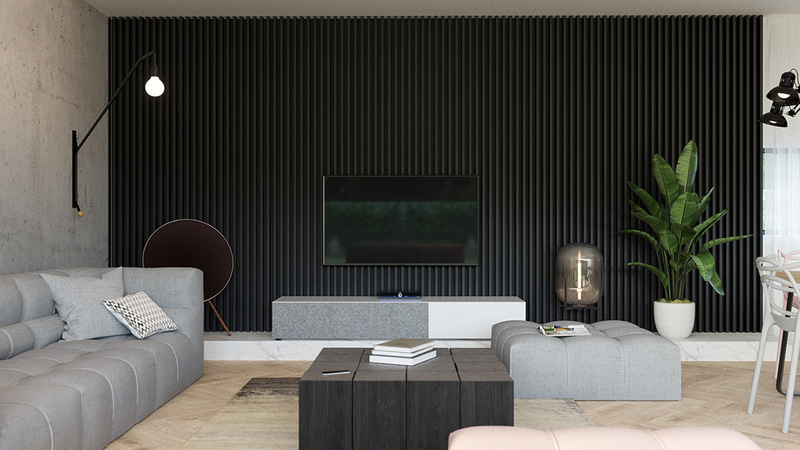 An Oda style lamp stands at a black slatted feature wall. Originals are available here. A two tone media unit matches with the grey concrete wall, and with a white marble hearth that runs beneath it. 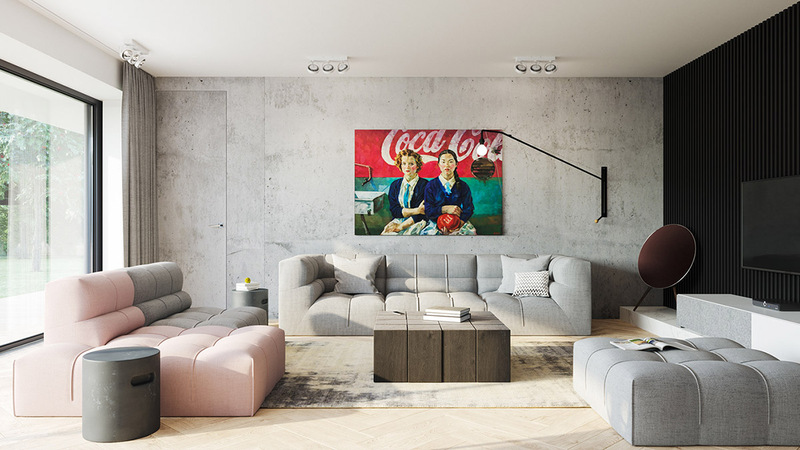 The heavy black walls and block style coffee table are balanced out with a sweet light pink accent colour, which appears in a section of the sofa and on some of the dining chairs. A small black side table serves the sofa. 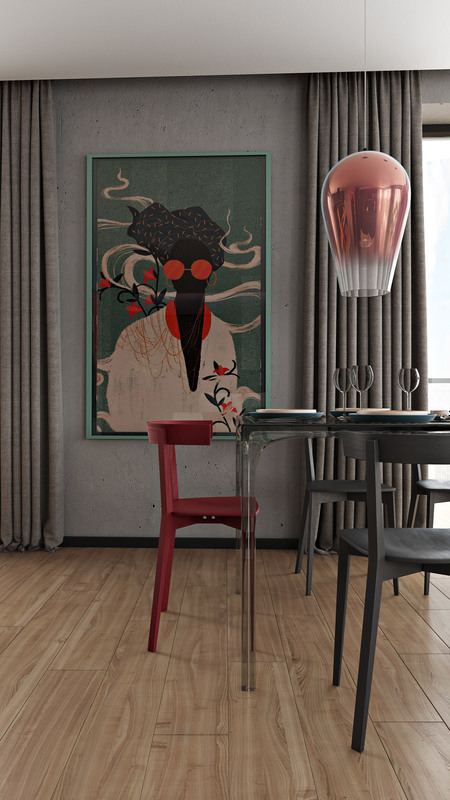 Above the dining table hangs a sprawling black modern chandelier, which is the Ingo spider chandelier. 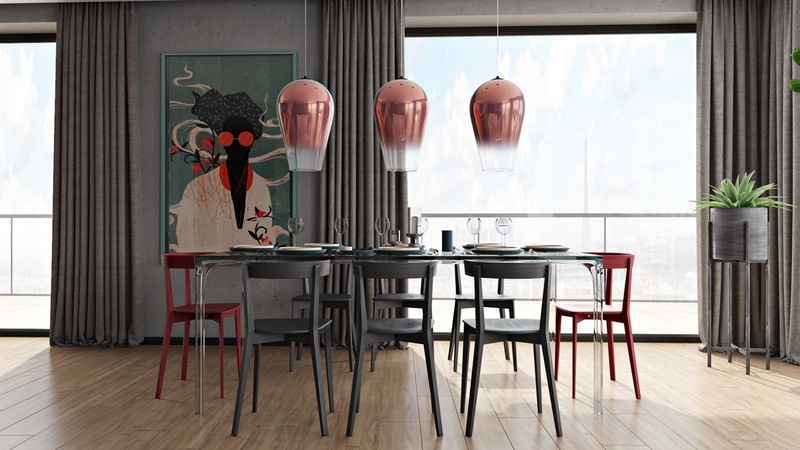 A wood dining table is surrounded by beige and pink examples of the Kartell Masters chair. 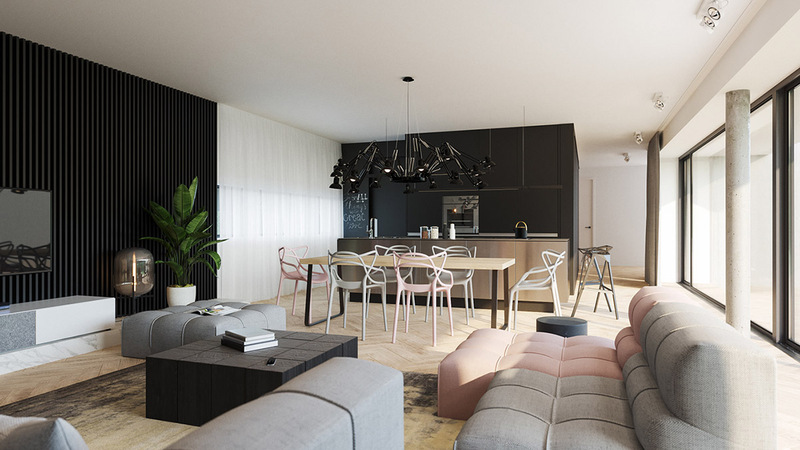 The open plan room is completed by a black one wall kitchen with a metallic island. The black kitchen walls can be used as a chalkboard for notes or personal art. A mirror finish integrated appliance shines at the centre of the matt black kitchen larder units. 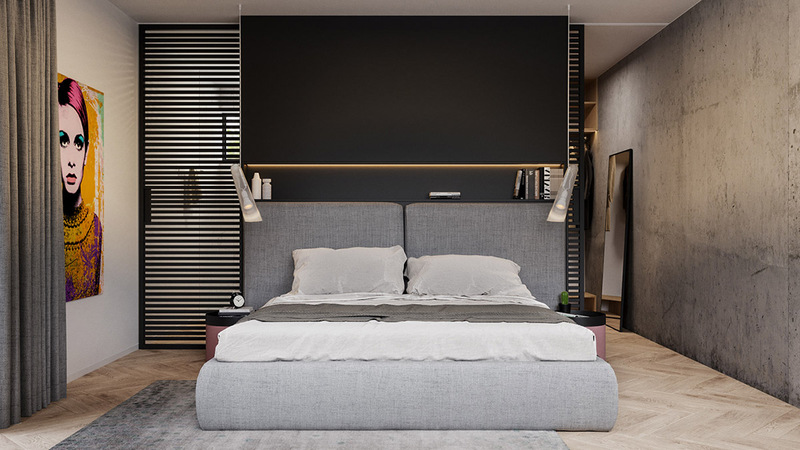 In the master bedroom, a black slatted door is installed at either side of a soft grey modern bed. 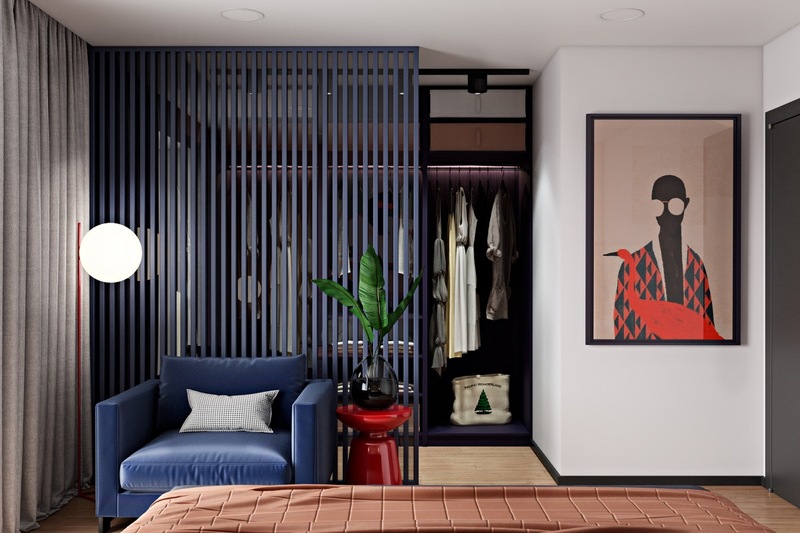 The pocket doors slide away inside the headboard wall to reveal a closet to the right and an ensuite bathroom on the left. Multicoloured wall art injects brave personality into the monochrome scheme. Pink bedside units with black tray tops peep out from either side of the bed; unusual bedroom pendant lights shed light over each one. 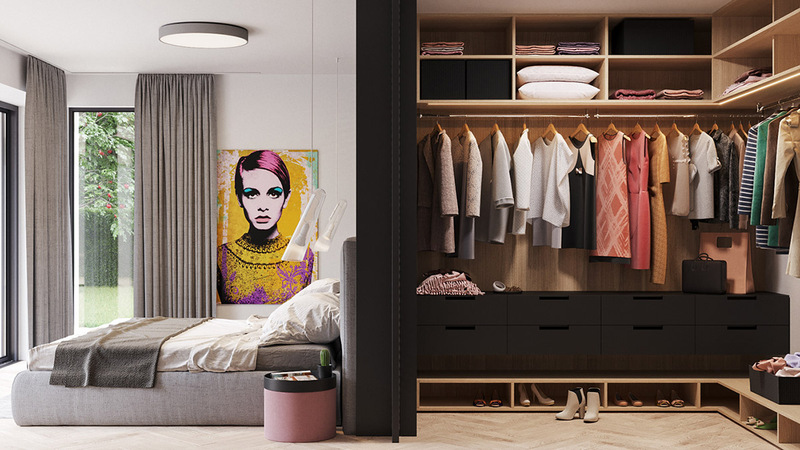 The walk-in closet behind the bed is decked out with a number of wooden shelving cubbies, on the wall for lesser used garments, and on the floor for a collection of shoes. Black chests of drawers line up beneath a generous run of garment rails. The ensuite bathroom on the other side has concrete wall decor behind a wooden vanity with a concrete basin. 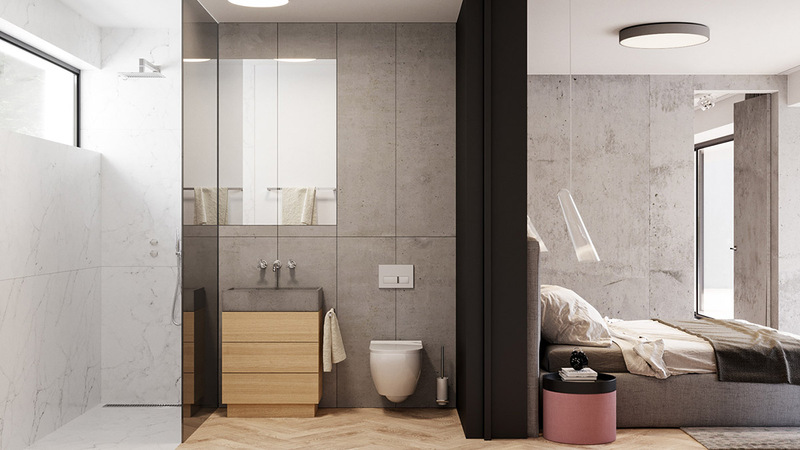 The toilet is wall hung and accompanied by a wall mounted toilet brush, which keep the small room feeling open and spacious. Light marble tiles clad a shower enclosure with a clerestory window. Pink accents make a comeback in the kid’s room, on bedcovers and a cute kid’s chair. 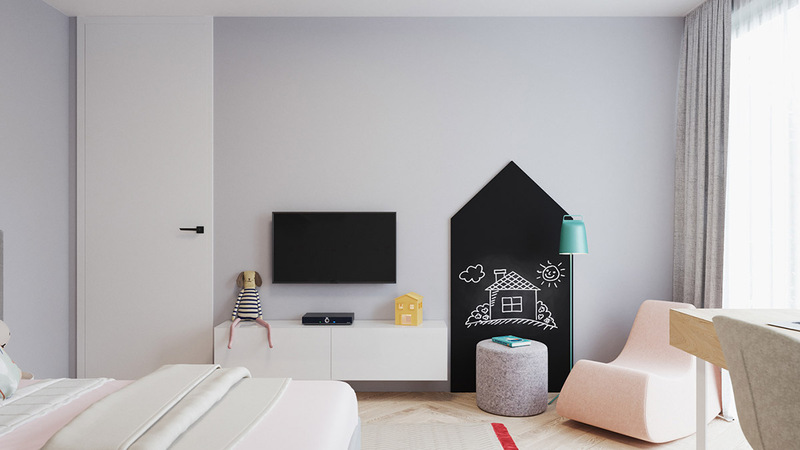 The wall mounted tv and a house shaped chalkboard brings the black base notes into the kids decor. 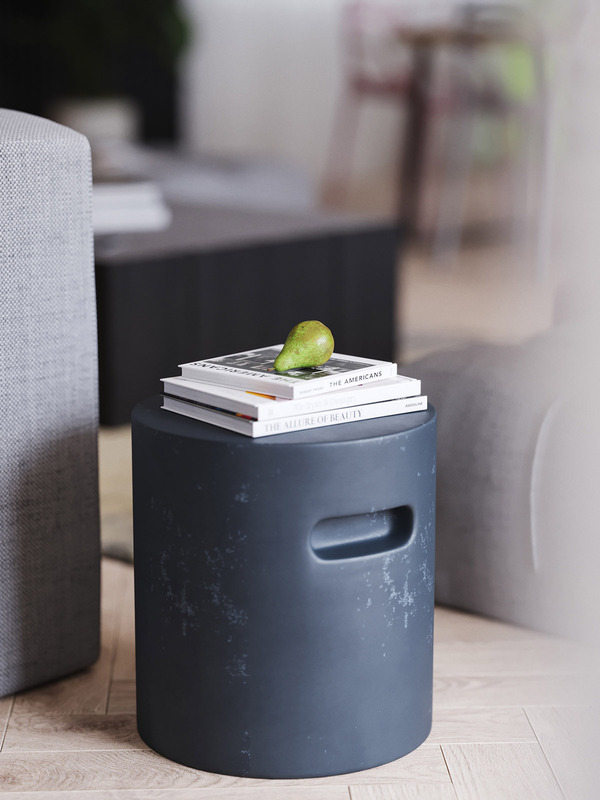 A small grey stool stands by the kid’s novelty chalkboard to provide a comfy place to sit whilst doodling away. Bright art sings solo in a concrete hallway.